We have compiled a new up to date Windows binary from the latest ccMiner 1.6.3-git by tpruvot (source). 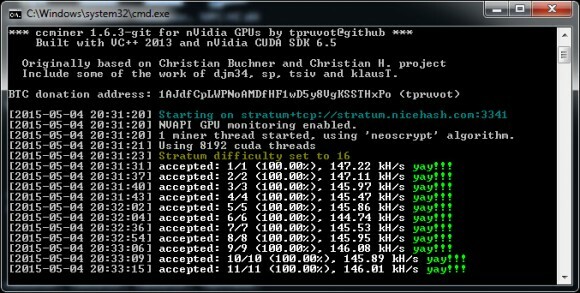 The latest version includes support for the NeoScrypt algorithm that has been improved over djm34’s initial work that might also work on older Nvidia GPU. There are also numerous code improvements included in the latest code, so if you are using tpruvot’s fork of ccMiner you might want to update. The previous windows binary release that we posted required Compute 3.5 as a minimum, this one is compiled for Compute 3.0 or newer Nvidia GPUs, but not all algorithms may work on older GPUs. Our windows binary is compiled with VS2013 and supports Compute 3.0, 3.5, 5.0 and 5.2 GPUs, you can download and try it below, there is an example BAT file setup for testing. We have compiled an up to date Windows binary from the latest ccMiner 1.6.3-git by tpruvot (source). 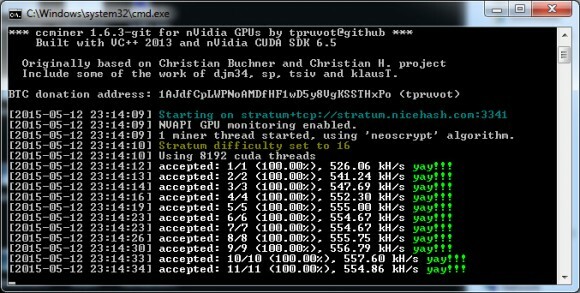 The latest version adds support for the NeoScrypt algorithm based on djm34’s work who recently added NeoScrypt support to his fork with minimum requirement for Compute 3.5 capabilities from your Nvidia GPU. With this version of ccMiner we are getting around 146 KHS hashrate mining NeoScrypt on a GeForce GTX 750 Ti GPU which is about the same performance we are getting on the same hardware using djm34’s fork which is to be expected. Our windows binary is compiled with VS2013 and supports Compute 3.5, 5.0 and 5.2 GPUs, you can download and try it below, there is an example BAT file setup for testing.